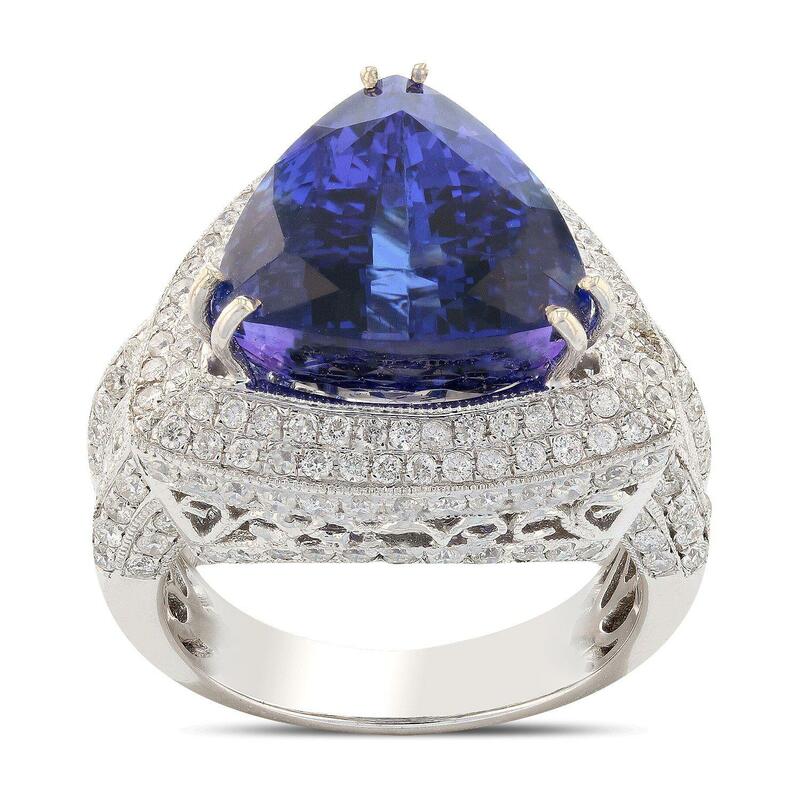 One electronically tested 14KT white gold ladies cast tanzanite and diamond ring. Condition is new, good workmanship. The featured tanznaite is set within a diamond bezel supported by a diamond set under gallery and diamond set shoulders, completed by a four millimiter wide band. Bright polish finish with milgrain detailing. Trademark is Orianne. Identified with markings of "14K". One prong set traingular modified brilliant cut natural tanzanite, measuring 12.89 x 13.06 x 10.07mm, exact weight 10.52 ct., clarity is eye clean, type I, dark, moderately no distortion, transparent. GIA Gemological Report attached. Graded loose prior to setting in the GIA Laboratory, Report #2155886978. Two hundred twenty-five bead set round brilliant cut diamonds, measuring 1.30 - 1.20 x 0.75mm (depth est.) approximate total weight of 225 Stones = 1.77 ct. Graded in the setting.